This month the team have been focusing on the seemingly endless task of rubbish clearance, with major clearances on Moulscoombe Estate, Hoggs Platt, Weald, Eastbrook farm, St Louie home, North Neville, Mile oak and Walpole allotments. Both St Louie and Hoggs Platt had single piles that were so large they took over a day each to remove. On top of this tyres have been removed from Tenantry Down and bonded asbestos has been taken from Weald and Hoggs Platt. Plot clearance for letting has also been taking place, most notably on Roedale valley, Thompson road and Moulscoombe Estate. Also water has been switched off and metres read on all sites, so please let the allotments team know if your water is still on. Site visits have been combined with autumn lock lubrication to help keep locks working over the winter months. There have been major track works on Tenantry down and Eastbrook farm where the maintenance team have been assisting contractors while regrading and resurfacing tracks. Gate repairs have been made on Whitehawk hill and Craven vale and fencing repairs on Tenantry down. This autumn the maintenance team have been really struggling to deal with the enormous quantities of rubbish that are being left on allotments, usually by tenants. Tyres, metal shelving, carpets, kitchen and bathroom furniture, broken tools, chip board, sofas, plastic containers and glass bottles as well as rusting bicycles, engines, trampolines and play equipment. You name it, the maintenance team have dragged it out of an allotment. 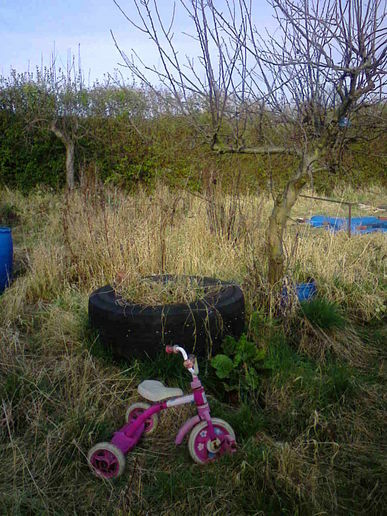 The majority of the materials that the team remove have no place on allotments and should never have appeared on site. So please think long and hard before you bring any materials onto your allotment. Please consider the following questions 1. Do you really need the materials for growing crops? 2. Would you put this in your garden? 3. Are you treating your allotment as an alternative to your local dump? We would encourage tenants to work together to discourage the bringing on site of any waste materials that are not used in the growing of crops. After all dealing with rubbish takes up the majority of the maintenance team’s time, and that means less time for strimming paths, controlling weed trees, preparing plots to let, fixing taps and fences and less time for maintaining paths and repairing haulage ways. If you suspect tenants or visitors of dumping rubbish on any allotment land then please let us know immediately by calling 01273 292929.